Many Africans, especially those in remote rural areas, live a long way from the global information highway. In many rural villages there are no satellite dishes, computers or televisions. But these villages contain a rich communication environment that predates modern electronic media by many, many years. Modern media may not only fail to reach many remote rural areas, but lack cultural credibility when they are available. Receptivity to outside messages can be enhanced by the use of traditional folk media that are often an integral part of rural life and that use the visual and oral expressions that are commonly understood by villagers. Traditional folk media are cultural resources that accumulate indigenous knowledge, experiences and expressions passed down from generation to generation. Woven into proverbs and poems, songs and dances, puppet plays and stories, rhythms and beats, they are embedded with a strong sense of cultural identity which can be a potent force for development. In many cases, these media are the traditional conduits of indigenous knowledge, experience and culture. Creative use of these cultural resources in communities where they are popular and well entrenched can be a subtle and effective way of introducing development ideas and messages. The use of traditional folk media in development is not new. For many years they have attracted the attention of communication professionals as an alternative or a complement to modern mass media. Traditional media have been used in family planning campaigns, in health care programmes, in environmental protection projects, and in adult literacy programmes, among others. Development communicators have used traditional media to help mothers learn to prepare more nutritional food for their children, to influence attitudes towards family size and to introduce new practices to farmers. Traditional folk media offer an effective means to integrate local agricultural knowledge with new scientific knowledge from outside sources. Some of the advantages of traditional folk media are that they do not require large capital investments and there is not a dependence on expensive communication technologies that are liable to break down. Traditional media can be used "live", and are likely to have the greatest impact when audience members can interact with the performers and artists and even participate. Alternatively, they can be coupled with other media such as radio and television. 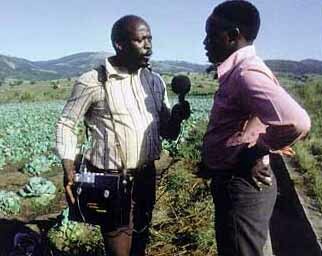 Since 1986 population communication teams have been working with traditional media in various African countries. In villages in rural areas of southern Malawi, for example, artists (drummers, dancers, musicians, actors and storytellers) were brought together for a week-long workshop to develop a series of songs and dances, stories and plays to address a number of population issues and lifestyles. These productions were pre-tested and integrated into a successful multimedia campaign with radio, audiocassettes, visuals, drama and print. The Malawi experience, which is still underway, has shown the potential of using traditional media for development purposes. Using traditional folk media requires skill in the crafting of development messages into the fabric of the media. It is best done through close collaboration between development workers and folk media artists and performers. Rural radio is distinctive from urban radio in that it is directed specifically to rural people and their information needs. In many cases, the information needs of rural people are virtually ignored by national radio networks. A rural radio approach is an alternative to narrow, city-centred urban radio. Rural radio has a rich history. The first rural radio programmes in Africa appeared in the late 1960s, growing out of educational radio efforts in Europe, Canada and the USA. One of the most significant contributors to the evolution of rural radio was the Radio Forum movement in Canada from the 1940s to the 1960s. Listening groups gathered around a radio receiver at a given time to listen to a programme on specific agricultural topics. At the end of the programme, the group discussed what they had just heard and sent their comments and questions back to the radio producers. At its height, the Radio Forum involved 1 600 groups across Canada with a total audience of 30 000 listeners. 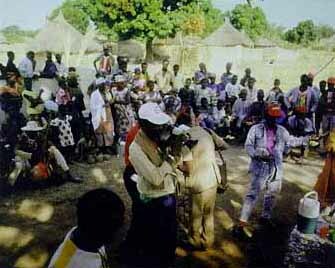 In Chad radio was used in a 1991-92 campaign to stop intentionally lit bushfires. These fires were traditionally used to clear agricultural land for planting. With degraded, fragile soils and the accidental spread to forest reserves, this age-old practice was no longer sustainable. Radio broadcasts were used to encourage villagers to voice their opinions and propose solutions to the problem. The result? Within one year, forest fires were reduced by 90 percent, 22 villages had active bushfire control committees and firebreaks protected 10 000 hectares of forest. "Let's unite. If the entire village gets organized to fight bushfires you'll never be afraid of bushfires again!" From these early efforts, a methodology for rural radio evolved which was based initially on mixed programming (combining agriculture, health, oral tradition, music, and folk tales) and subsequently developed into a more interactive use of the medium. Today, it is widely recognized that rural radio programmes are most effective when produced with audience participation, in local languages and taking into account cultural traditions. Community participation is a fundamental characteristic of rural radio – live public shows, village debates and participation in the actual management of the radio station are just a few examples. This approach empowers rural people to participate in the dialogue and decision-making processes essential for them to control their own economic, social and cultural environment and play an active part in development activities. a tool which, combined with other media, can be used for training and the transfer and exchange of knowledge and technologies. In Africa, radio is one of the most widespread and popular tools of communication. It is, therefore, a very appropriate communication technology to address food security, poverty reduction, environmental protection and a host of other areas of concern to rural Africans. Rural radio often goes beyond agricultural issues to address a wide range of related social, educational, health and cultural issues. It is excellent for motivating farmers and for drawing their attention to new agricultural production ideas and techniques. It is inexpensive, has wide coverage and is readily available, even to very remote rural populations. Programme production is relatively simple and local stations can easily create their own content. In recent years some important changes have taken place in radio in Africa. Once a top-down medium for delivery of messages, it is now becoming more interactive, with opportunities for dialogue, exchange of views and debate. Centralized radio, based in the capital or in the major urban centres, is becoming decentralized with many regional and local stations. Government controlled radio is being joined by independent, private radio stations. Deregulation and decentralization, the ending of state monopolies and the emergence of new commercial broadcasters are all creating a more positive context for rural radio - one which encourages closer and better interactive communication with African communities and which empowers rural people to actively use this important tool for their own development. 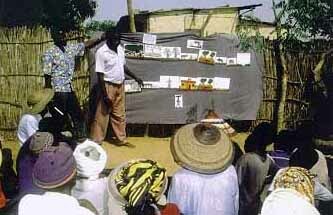 standardize information so that it is transmitted accurately from technical sources to farmers. Video is an effective communication tool to increase awareness about specific development problems and stimulate local discussion of possible solutions. It has become relatively cheap and easy to use. In the last decade, the cost of video equipment has decreased from about US$10 000 to 3 000 and the weight has dropped from 30 to 3 kg. With some basic training, rural people can prepare video presentations about community development concerns in local languages. Editing can be done in the camera and through immediate playback video production results can be quickly viewed. Presentations can even be shown in areas without electricity using battery-powered monitors. 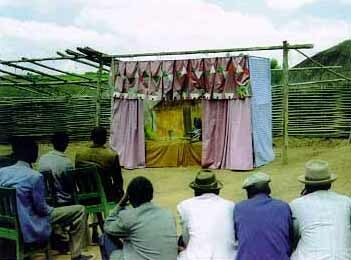 Initially, many development planners dismissed video as too "high-tech" and as an "inappropriate technology" for working with rural communities. Experience has shown otherwise. In many development settings, small-format video, in the form of consumer grade video cameras and portable monitors, has enabled rural dwellers to share their experiences with one another across vast distances; access up-to-date knowledge prepared by agricultural technicians; and speak directly to otherwise unapproachable decisions makers. The Centre for Audiovisual Production Services (CESPA) was established in Mali after successful experiences training farmers in Latin America utilizing video coupled with guidebooks and group discussions. In the early 1980s, an FAO project in Mali has as one of its objectives the training of plant sanitation agents. A large number of trained agents were needed so it was decided to carry out mass training sessions using video. This method had been successfully used in Latin America, and a Peruvian video expert was recruited to carry out the training in Mali in 1984/85. The successes of this training approach led to an FAO project from 1988 to 1992 to establish an audiovisual production centre. 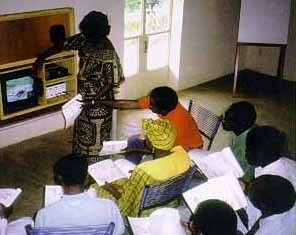 The project began by training a group of "audiovisual pedagogues" who were then hired by the Centre. The project focussed primarily on multimedia training of farmers, but also included were social and cultural programmes for rural people. Participatory video was an essential communication tool. Initially, CESPA operated as a non-profit, public service organization for training farmers. However, policies which emphasised private-sector initiatives, income generation and financial sustainability , resulted in the commercial evolution of the Centre and the widening of its audience. Today, CESPA is financially independent and continues to successfully produce audiovisual training material for thousands of farmers and rural residents in Mali as well as provide services to institutions and clients across West Africa. It has also become a major centre for advice and training on the use of participatory video as a development tool for Africa. Perhaps the most significant, but frequently misunderstood, aspect of participatory video is that for the local people involved it is the process of communication that is vastly more important than the video product that is created. Instead of being used as a one-way broadcast medium, video can be used as a communication process tool which enables rural people to address their information and knowledge needs to achieve their development objectives. In Africa, FAO is applying participatory video to rural and agricultural development based on experiences that have been successful in Latin America using a methodology called "rural audiovisual pedagogy". This methodology uses participatory video as a communication tool for mediating between rural people's needs and the possible sources of information and expertise to respond to those needs. This is achieved through the production and use, with local communities, of video documentaries and training presentations. Used in this way, video can empower rural residents to actively participate in development by articulating their ideas and taking part in decisions; by recognizing the value of the skills they already possess while gaining new knowledge; and by planning and carrying out local development activities. Experience has shown that rural people who have benefited from participatory video training are more apt to address their own development problems, use newly acquired skills and knowledge, and act as development agents for neighbouring communities.